Big news from Kickflip today! We're proud to announce the Kickflip now works with Google Glass, meaning it's not possible to add live video broadcasting to all of your Google Glass apps! One of the most interesting aspects of Glass is the perspective of the camera. Video captured with a head mounted camera exhibits much more natural motion than one held in hand. 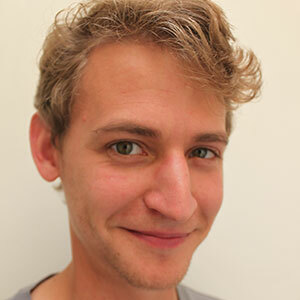 Telltale camera shake that we've come to associate with mobile video is also significantly reduced. Google's heartstring plucking Glass ads are a testament to the fact that wearable cameras produce more intimate feeling video than was previously possible. When we got our hands on Glass, there wasn't a great way for developers to wrangle this new perspective. That changes today with GlassCast: free and open-source Glassware for broadcasting live video directly from your Google Glass. You can modify GlassCast or develop a brand new application for Android (including Glass), and iOS using the Kickflip SDKs! All you need to try GlassCast is a free Kickflip Account. 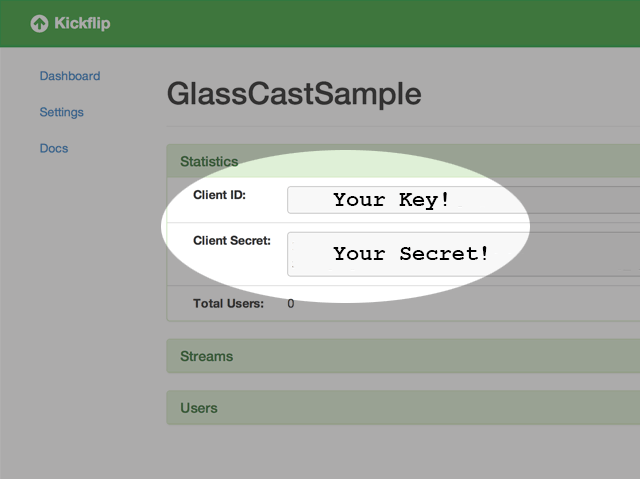 Sign in to your account dashboard to create a new Kickflip app for GlassCast. Creating a new Kickflip app. 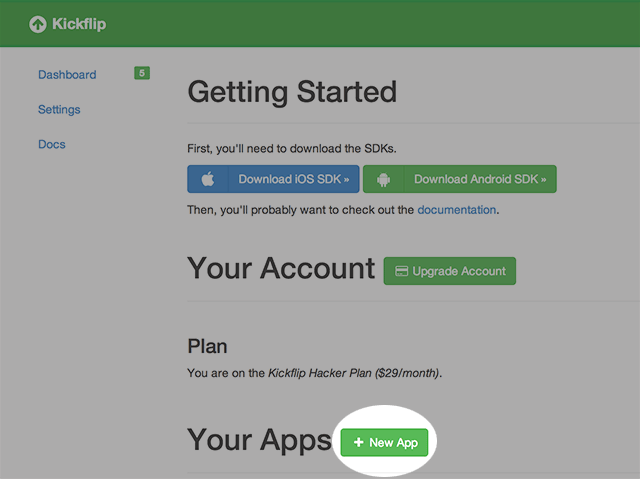 After choosing a name for your app you'll be presented with your Kickflip Client ID and Secret to bundle with your Glassware. Retrieving the client keys for a Kickflip app. To start GlassCast use the "Start Broadcasting" Voice trigger. To stop broadcasting, tap your Glass touchpad. GlassCast is an evolving project, so open an Issue on Github and we'll get to it. We're still pondering how to best allow sharing of your broadcast from the Broadcast UI, for example. You're free to use GlassCast as the starting point for your own Glass-powered broadcasting app! Remember that Kickflip's HLS video streams are distributed by a global CDN so they're ideal for broadcasting to very large audiences. Check out GlassCast on Github! Kickflip is the easiest way to add live video broadcasting to any mobile app!